Below are a couple of shots, taken in the garden yesterday, I thought may be of interest particularly to Peter H.
I was drawn to a silvery flash in the sunlight, shining on a lavender in the back garden and noted a Garden Spider had constructed a strategically placed web across the path used by Honey Bees. A bee had obviously been entrapped and the flash was the rotating corpse being encased in silk as the spider finished packaging it. Close inspection revealed that the spider was having problems with flies, yes flies small black ones (sp?). The size can be seen compared to the size of the bee. As it rotated its prey the flies persisted in landing on the encased bee. The spider plucked at the web, vibrating it, frightening the flies off briefly, they returned in an instant. It even tried to brush them aside with its feet, to no avail. The flies seemed absolutely oblivious and unaffected by the web flying through it without becoming entrapped themselves. 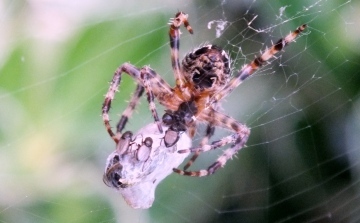 Eventually the spider gave up and left the prey to the flies. I was left wondering what it was that attracted the flies in the first place. They were interested in the head end of the prey and only conclusion I could come to was that the bee had been storing nectar to take back to the nest. This was released as the result of sedation by the spiders venom and soaked into the surrounding silk. I would be interested to hear comment on this observation and whether it happens commonly.